Honeywells Xenon is also already a classic among high-end handheld scanners, and is an undisputed top-performer in the Honeywell portfolio. Just like 1902g, the Xenon 1902g-bf is ideally suited for usage in retail, warehouses, production and logistics. The high-performance engine reads poorly printed or damaged 1D, 2D and stacked codes particularly aggressively and is Digimarc-ready. A highlight the area imager has no batteries or rechargeables in the usual sense A super cap is integrated, bringing you numerous advantages for daily use say goodbye to costly battery management - which also makes the device environmentally friendly. The extremely short charging cycle of the super cap - less than one minute - allows it to quickly go into action, where you perform up to 450 scans. 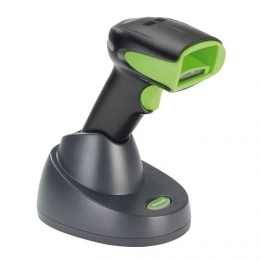 After charging for 15 seconds, the barcode scanner is ready to go again. This, plus the devices longevity at a consistent performance, secure your investment.